That's right. I finally caved. I let Santa send an Elf to our classroom. Meet Mr. Sparkles. On his way to our classroom, he saw these doughnuts that reminded him of snowballs from the North Pole. He decided to bring the kids some - and he had a couple of letters for us. The first was a letter from Santa, introducing the Elf. The second was a letter addressed to Mrs. Madden. It said that Santa knew our class used the Whole Brain Teaching scoreboard and it gave the kids a little challenge. 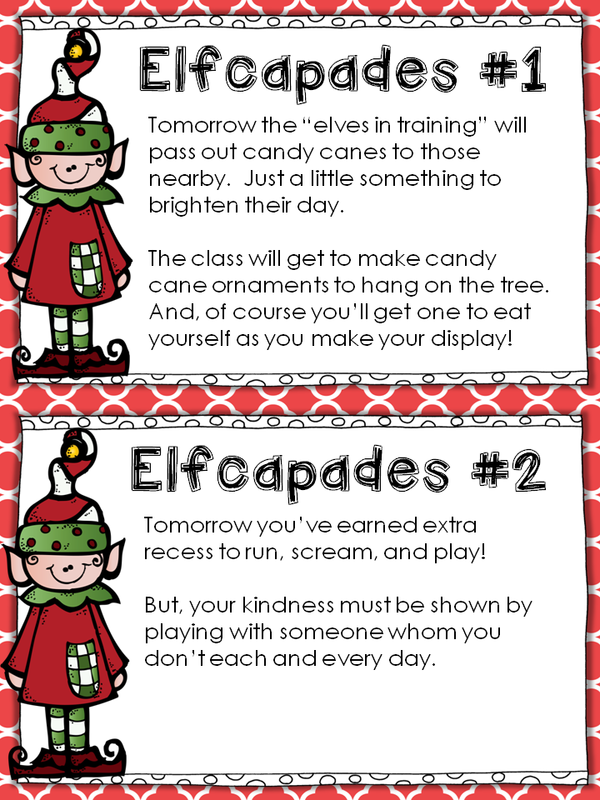 As you can see from these examples, the "gift" (note) is a little fun reward for the kiddos each day but also a way for them to spread kindness somehow. Our Elf just prepared 12 mini-gift bags numbered with the day and placed the note that corresponded to that day inside of the bag. Easy peasy little present! If you'd like to read more about this, or use this idea in your classroom, I've compiled it all into a little printable pack. While, it's not editable, I hope that you can use (at least) parts of it, or that it will help spark a way that you can use it with your class. 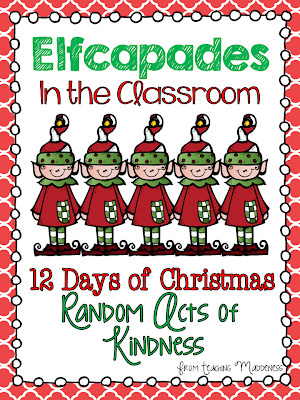 Amanda, I am SO happy that I didn't miss this awesome Elfcapades packet! I too, wavered about the Elf on the Shelf-actually bought it ($32.00!) and really wasn't gung ho about it at all. Brought it back to Target today. 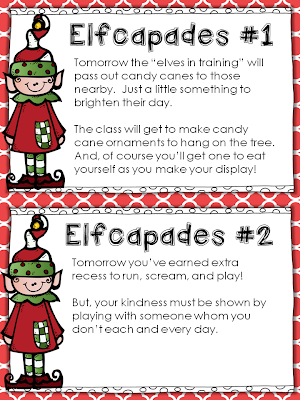 I have a small, friendly elf for my classroom, and your Elfcapades is perfect-so excited to use the activities! Thanks so much! LOVE the scoreboard idea. What items do you plan on giving them to open? I would love to start this tomorrow! Thank you so much for your Elfcapades freebie. I wanted to do this with my class but never would have thought to connect it to the score board. Brilliant!!!! I will be using as much as possible. 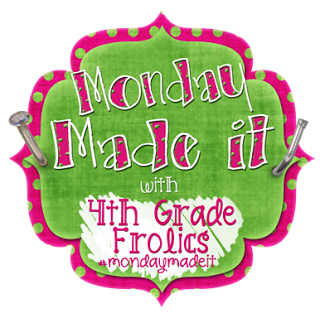 I'm new to second grade and always looking for ideas especially with this strong willed class I have this year. They're giving me a run for my money for sure! Mr. Sparkles looks like he is a VERY sweet elf! Love the Elfcapades! Thanks so much for sharing! Adorable idea! 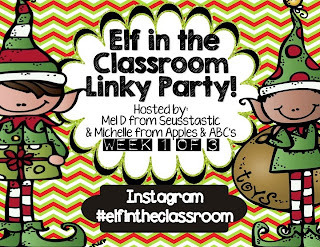 I haven't gotten an elf for my classroom…I didn't know if my second graders would buy into it or not. Love this though. 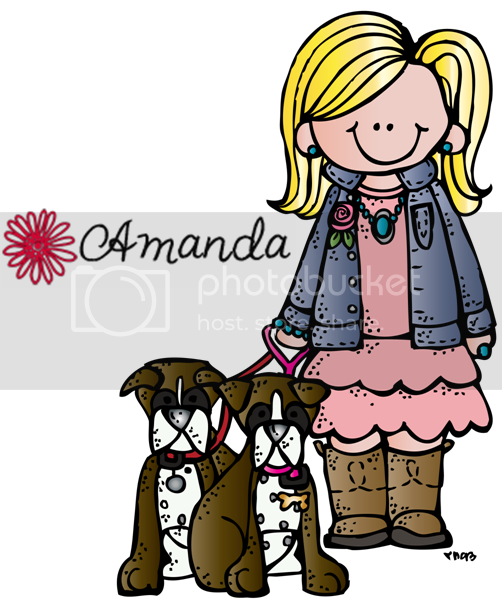 Great idea, Amanda! I bet your kids are on their best behavior the day after they open a present but don't get to keep it! Thanks for the freebie Amanda! I love the way you tied their special treats to the scoreboard! So smart to combine this with the scoreboard!!! I love the idea of random acts of kindness from the elf - this can be something I do with my son who is getting a bit old for just the elf moving around the house. THANK YOU!